Val's Quilting Studio : Why Do You Make Charity Quilts? If ya get a chance, stop by Sarah's to find out why I do. I've also been randoming sewing by H2H Happy Chemo quilt together. I will post that bright Hexi flimsy this week. (Hmmm...Go see grandson & kids or sew?) Well, admittably, a visit is always worth giving up my "Sunday Sew" day. Besides, Summer break is just six weeks away! (I think we teachers look forward to it more than the kids.) Although I do admit, I'm a life enthusiast and wish I didn't need eight hours of sleep and that days were longer so I could do everything I want to do! Teehee! Anyhoo....It's still NOT too late to donate a quilt. Check out all the charities right here. You wrote a great post over at Sarah's. 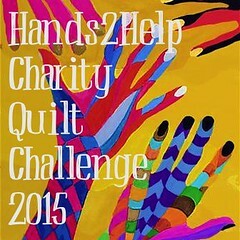 I am happy to participate in the H2H challenge along with you. I enjoyed your H2H post also And your quilting designs add so much fun to your creations! You had a lovely post today and thank you for sharing. I can't imagine why teachers look forward to the Summer break more than the kids?? ;)) I am off to check out your H2H post. What a great way to celebrate your return to good health.